The first doubts over the future of globalization were expressed after 9-11. Many were concerned that the added security costs would make the cross-border movement of goods more expansive. Nearly everyone at the time embraced China's entry into the World Trade Organization in late 2001. It helped turn the sentiment around about globalization. 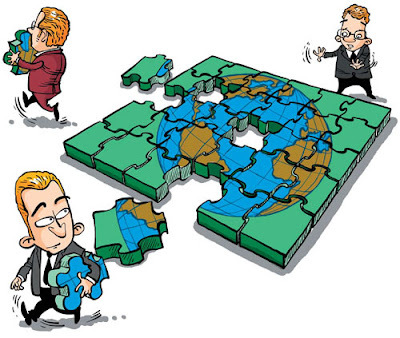 Indeed between 2001 and the Great Financial Crisis, globalization went into overdrive. The cross-border movement of goods, services, and capital exploded. And then the bust came. Trade and capital flows have not returned to their previous, bubble-levels, but have improved from the dark days of the crisis. In addition to people, goods, services, and capital, another flow materialized and complemented globalization: Information. Think email, international skype minutes, and online shopping. This is a relatively new form of globalization that appears to be growing exponentially. Still many see the UK decision to leave the EU, and the US decision to abandon its 70-year strategy of first foisting and then expanding a multilateral rules-based trading order, as evidence of the end of globalization. Surely it is possible, but is it really the most likely scenario? First, the tariffs that have been announced, including the 10% tariff on $200 bln of Chinese goods, and the retaliatory tariffs cover a relatively small amount of global trade. Tariffs on auto would be a bigger deal and would be larger than the other actions put together. Even then, comparison with the 1930s and Smoot-Hawley would be a stretch in terms of the percentage of goods and trade that are impacted. Second, other countries have not abandoned their commitment to globalization even if the US Administration harkens back to the unilateralism that came to the fore after WWI when the US Senate rejected President Wilson's proposal to launch a League of Nations. For example, the US pulled out of the Trans-Pacific Partnership, but a new agreement without the US has been signed. After nearly five years of negotiations, the EU and Japan signed a free-trade agreement today. The two economies cover about a third of the world's GDP and a bit less than a tenth of the world's population. The approval process can take a year and the agreement is hoped to come into force by the end of next year. The agreement includes a six-year phasing out of EU's 10% tariff on Japanese auto imports and the reduction of duties and regulatory obstacles for Europe's agricultural exports. Separately, the EU and Japan also offer mutual recognition of the other's privacy protections. It is the largest such deal for the EU. Trump briefly mentioned the elimination of all tariffs at the G8 meeting, it was seen as a throw-away line, almost like Reagan's talk about nuclear disarmament with Gorbachev in Reykjavik in 1986. The EU and Japan are on the verge of achieving it. The trade agreement would reduce about 99% of Japan's goods shipped to the EU. Tariffs on about 94% of EU goods to Japan would be removed. The difference is thought to reflect Japan's insistence on protecting its rice farmers. After several years, the agreement will eliminate 99% of Japan's tariff on EU goods. The World Bank tracks tariffs. What we are most interested in for comparative purposes is a weighted mean tariff that is applied. The latest data is from 2016. The weighted means tariff applied by the US stood at 1.61%. For the EU it was at 1.60%, Japan 1.35%, and Canada 0.85%. By contrast, China's is 3.54%, and Mexico is 4.36%. Emerging market economies enter the WTO with a higher tariff schedule, but it is easier for others (market economies) to deploy anti-dumping defenses. China has been campaigning to be recognized as a market economy. China has been reducing its tariffs on some goods broadly and has reduced tariffs. Europe has been busy in a quilt of free-trade negotiations. A few trade agreement has been provisionally implemented as the ratification process continues. A political agreement was struck with Mexico at the start of Q2. Talks with Chile, Mercosur, and Australia are on-going. Negotiations with New Zealand are in early stages. The US has imposed tariffs on steel and aluminum claiming risks to national security. A national security justification for tariffs has not been explored. It is an accepted defense, but the meaning has thus far been interpreted to be considerably narrower than the US is claiming. Several countries are challenging the US claim. Meanwhile, the US is claiming that since national security is a legitimate reason for the US tariffs, the retaliatory tariffs are illegal. To this end, the US has filing case against the retaliatory tariffs by the EU, China, Canada, Mexico, and Turkey. Other countries, including Russia and India, have also indicated they will retaliate. Many observers suspect that the US Administration is using tough negotiating techniques but is ultimately still committed to free and fair trade. The debate appears to be whether some a deal is reached before or after the midterm elections in November. Whatever the case is, it is clear that no hard and fast conclusions can be reached. The situation is still very fluid, but obituaries for globalism are premature.